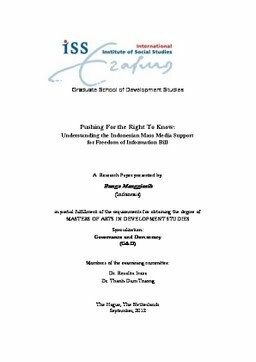 Eight years were needed to negotiate Freedom of Information (FoI) legislation in Indonesia before it was passed in 2008 by Dewan Perwakilan Rakyat (DPR, House of Representatives). A coalition of non-governmental organisations (NGOs) was the initiator and advocate of the process, supported by mass media. The research paper probes to critically investigate the motives of the support. Findings show that beyond the facade of anti-corruption, FoI, and freedom of press, the media identified benefits benefits for themselves. Amongst others, FoI legislation gives greater access to newsworthy information, and opens a lucrative business advantage as the law orders public agencies to advertise their information. The media successfully used FoI issues to leverage their political-economy interests of the corporations and owners, which sets precedence for future use of the law. Relevance to Development Studies Mass media is one of the key parts of civil society which can determine the political course of the state. Media played significant role in supporting the FoI Bill campaign in Indonesia. This paper aims to understand the political and economy motives mass media, the aspect that seems to be overlooked by previous studies.